There's nothing more American than grabbing a hot dog at the ballpark. So we're sharing the best places to catch a game on the Shoreline this summer. From our local Hartford Yard Goats or a quick trip to Rhode Island to catch the Pawtucket Red Sox - we've got game night covered. Image courtesy of "The Patch"
The Hartford Yard Goats are a Minor League Baseball team in Hartford, Connecticut. The Yard Goats, which play in the Eastern League, are the Double-A affiliate of the Colorado Rockies. "Kid's Run the Bases" games, themed nights + fireworks every Friday and Saturday evening. Even better? How about goat yoga at the park. FYI- Don't wait to get tickets, this stadium sells out! Image courtesy of the "Connecticut Tigers"
The Connecticut Tigers are a minor league baseball team located in Norwich, Connecticut. They are members of the New York–Penn League and associated with the Detroit Tigers franchise. Enjoy themed games + fireworks every Friday night. Image courtesy of "The Boston Globe"
The Newport Gulls are a wooden-bat, summer collegiate baseball team based in Newport, Rhode Island. Enjoy a full day in Newport, RI and end the day with a baseball in the heart of town. Don't forge to grab drinks at the 1908 Public House, their backyard deck is in the outfield. 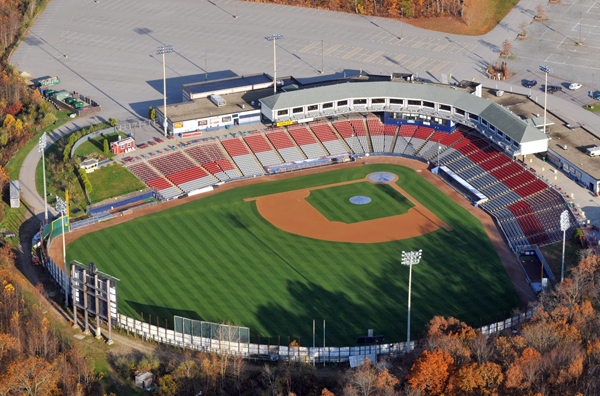 The Pawtucket Red Sox are the Minor League Baseball Triple-A affiliate of the Boston Red Sox and a member of the International League since 1973. A quick trip outside of Providence, a great day-trip option!